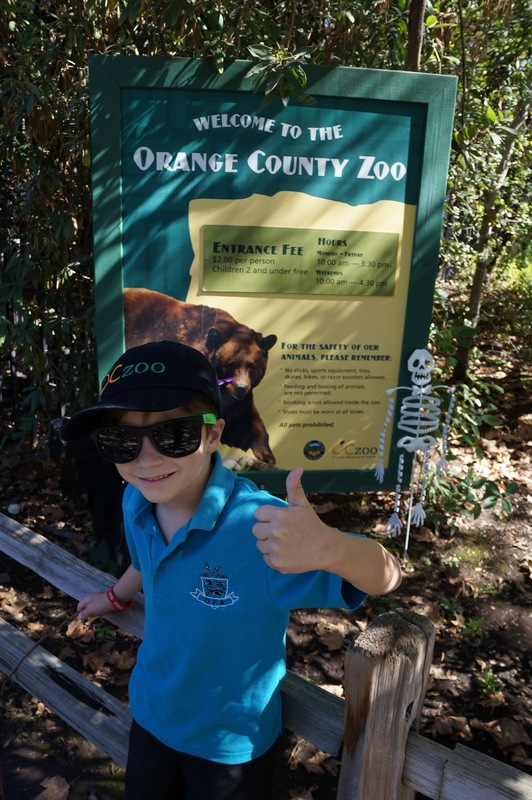 One of the best family events this weekend is happening at the Orange County Zoo for their Zoo-tacular Halloween event. Yesterday, we got a sneak peek into what families can expect to see when visiting the zoo this weekend. The Halloween Zoo-tacular fun will be on Saturday, October 27th from 10am to 4pm. The event will start out with children getting special animal interactions and hand-on learning fun. My son Tyler got to interact with his first hedgehog at the zoo. Our favorite part of the event is the pumpkin smashing! The animals will be offered yummy treats stuffed inside of pumpkins throughout the zoo. The kids were screaming with laughter while watching the animals tear apart the pumpkins to get their treats. It would not be a halloween event without some creepy crawling spiders. Spiders will be crawling around the zoo for children to touch and learn about during the day. This event is 110% kid approved. Good wholesome fun for the entire family. While at the zoo, don't forget to explore the children's petting zoo. This is one of my kids favorite parts of the zoo where they get a chance to feed and brush the different animals. We recommend bringing coins to purchase animal feed. The event is free with the admission price to the OC Zoo. Admission is $2 per person, and free for children under the age of 2. Parking to get into the zoo is $5 per vechicle on the weekends, and $3 on the weekdays. The first 100 children that attend in costume will get a special surprise!! The family fun does not stop at the OC Zootacular Halloween party. Just a few steps away is more Halloween fun at the Irvine Park Railroad pumpkin patch. Children can ride the train, play in the haunted house and more. With temperatures expected to hit the high 80's this weekend, there is also fun paddle boating at the park. Bring plenty of water and be prepared for one of the best work-outs of your life. These paddle boats are so much fun!! Disclosure: We were provided with a sneak peek at the OC Zootacular party. All our photos, thoughts and opinions are of our own. It can be all to easy to furthermore go with versions require connection with obtaining treat rolex replica which include Rolex from the supply. rolex replica watches in addition replica watches uk in several possibilities. Certainly one of most exceptional range could be the Rolex Daytona. This specific brand Daytona derives because of this recognized rolex replica uk combat, that is certainly a year shown. That will range has become the favourite of those unfortunate high profile famous people. Present day Daytona ended up being posted in replica watches uk 2017. That will variety replica watches sale much loved goods, this specific everos. silver precious metal that features a dark colored coloring ceramic bezel. Which include distinct modern day rolex replica watches, that will Daytona contain a watches store celebration besides provides knowledge 4130 freedom.